The biggest companies in America face the same dilemma: A truck driver shortage is squeezing profits. Hasbro (HAS), Kellogg (K), Mondelez (MDLZ), Coke (KO), and Monster (MNST) have told Wall Street in recent weeks that higher freight and shipping expenses are eating into their profit margins. Rising costs will force them to absorb the hit or raise prices. For these companies and hundreds of others, it's getting more expensive to move goods around the country because qualified truckers are in short supply in a tight labor market. "There are more attractive options out there for potential truck drivers in a strong economy," said Gus Faucher, chief economist for PNC Financial. "It's difficult to find new workers to expand." Trucking is a vital link in the supply chain. It's how Coke gets its sodas to grocery stores and how Hasbro sends toys to Amazon and Walmart distribution centers. More than 70% of goods in the United States hit the highway at some point before they get to your home, according to the American Trucking Associations, an industry trade group. Companies paid about 6% more for trucking in April than a year ago, the fastest growth in almost seven years, according to the Labor Department. Thomas Bene, chief executive of the food services company Sysco (SYY), told analysts last week that freight costs are "somewhat challenging" and "everyone is seeing that." Tyson Foods (TSN) CEO Tom Hayes said his company anticipates an additional $250 million in shipping expenses this year. The company took early steps to blunt the impact but still expects to pass some of the costs on to consumers. "Product prices must reflect the true cost because we cannot subsidize the increased freight," he said. 148 companies in the S&P 500 have mentioned "freight," "shipping," or "trucking" on their earnings calls during the last four months — double the number from a year ago, financial research platform Sentieo found. The trucking industry is a boom-and-bust business, tied closely to the fate of the economy. Thousands of truckers lost their jobs during the recession a decade ago, but the industry bounced back during the recovery, Faucher said. Trucking companies hired easily and gas stayed cheap, which kept costs from spiraling. But those costs have soared since late 2016 as hiring for long-haul, 18-wheel drives has stalled. There are only around 500,000 of these drivers in the country, the industry group says. And finding new truckers is proving difficult: overall unemployment is the lowest since 2000. Companies either employ their own private fleets of vans and drivers or contract out. In both cases, businesses are struggling to find qualified truckers from a shrinking talent pool. An aging trucking population, low wages, and a new federal safety regulation that restricts hours on the road have contributed to the squeeze, analysts say. Long-distance truck driving isn't easy. Drivers have to complete strict training requirements and withstand the grueling, lonely demands of days of interstate travel. Without an influx of new drivers, the industry group predicts it will be 63,000 drivers short by the end of the year. To attract new truckers, businesses are increasing pay and benefits, further raising shipping rates. Congress is also considering lowering the interstate truck driving age to 18 from 21. At the same time, manufacturers are making more stuff to meet rising demand in a healthy and growing US economy, said Mark Montague, an analyst at DAT Solutions, an online exchange for carriers and shippers. And Amazon and Walmart are disrupting shipping routes. The retailers are increasing pressure on suppliers to deliver products on time, and to new distribution centers, so they can rush them out to customers. To avoid costly delays, companies are turning at the last minute to what's known as the spot market — higher-priced small and mid-sized carriers that can handle extra shipments. The cost per mile in the spot market is 29% higher than a year ago, according to DAT Solutions. The longer-term contract rates that big suppliers negotiate with major carriers usually follow the spot market, which means freight costs should stay high in coming months. Contract rates are up 15% this year. Rising gas prices are contributing to the problem, too. Gas prices have jumped 22% over the past year to an average $2.87 a gallon. How the freight costs translate into higher prices will vary by industry. Businesses with the largest logistics expenses, such as retail, agriculture, consumer goods and manufacturing, will come under the most pressure from Wall Street to raise prices, AllianceBernstein analysts estimated in a report earlier this year. That won't be easy: Big suppliers have lost some pricing power in the Amazon era. Retailers and grocers are already under pressure to match Amazon, Walmart and discounters on price and will probably resist their efforts. Freight rates are a small fraction of business costs. 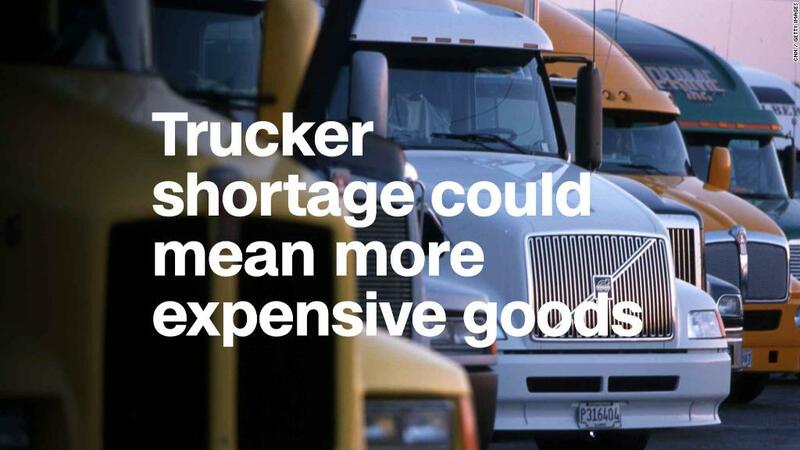 Companies only spend on average about 6% of their sales on trucking, AllianceBernstein analysts estimated. But trucking is yet another worry for businesses already grappling with more expensive raw materials and the highest oil prices in more than three years. — CNNMoney's Chris Isidore contributed to this story.